A proven 8-week Health Coaching Program, rooted in behavior change psychology, focused on creating lasting health habits once and for all! Feel as though their willpower is broken! Are smart and experienced enough to know that traditional ‘cookie-cutter’ weight-loss plans don’t work long-term, but are unsure what else to do! The CDC reports that nearly 70% of adults in America are either overweight or obese. And the U.S. weight loss industry is estimated to be worth $66 billion and growing! Why Do We Struggle With Creating Lasting Health Habits? Don’t blame the programs…or yourself. Clearly, there is more involved than meal plans and willpower. 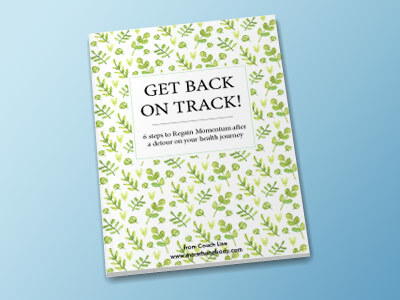 Creating new permanent health habits is nearly impossible if you don’t have meaningful MOTIVATION, clear and relevant GOALS, an achievable step-by-step PLAN, and an encouraging SUPPORT system. And that’s just the beginning. Behavior is greatly influenced by biological, physical, and mental factors that most people don’t even recognize. Wow…that’s a lot to consider! No wonder the statistics are so bleak. Studies show that having a specialized coach to guide and support behavior change increases your chances of adherence and ultimately success. What is the MORE APPROACH? Behavior Change Requires: Motivation (why change), Objective (what to change), Roadmap (how to change), and Execution (create the change). 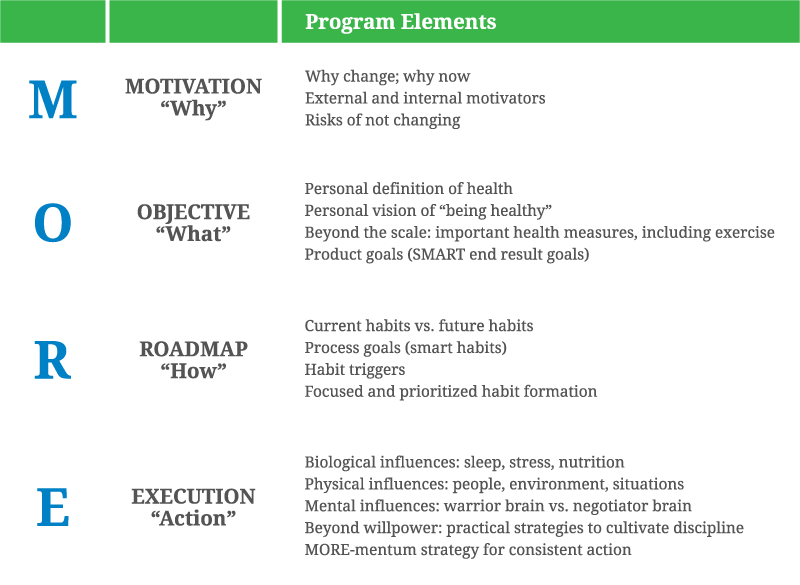 The MORE APPROACH incorporates each of these key elements in a systematic and practical curriculum, specific to behaviors that impact overall health and weight management. The curriculum unfolds over the course of 8 health coaching sessions. All sessions include take-away “Healthwork”: worksheets, resources, and supporting documentation to take further action and apply the lesson to real life. 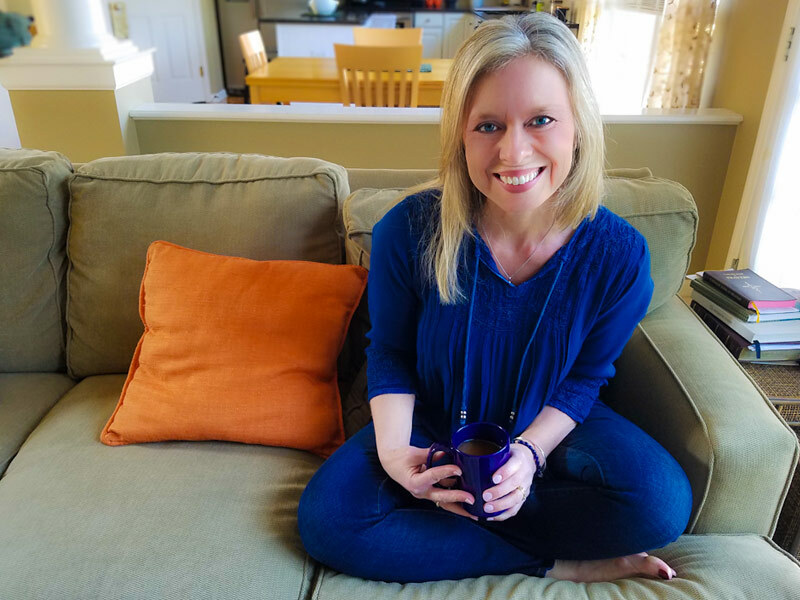 Facilitating the entire curriculum is a certified Health Coach specially trained in Behavior Change Psychology (read more about your coach here). Let’s apply the MORE APPROACH to a family dream vacation. WHY would your family want to take a dream vacation? Your motivation could be anything from relaxation to adventure. This motivation will lead to imagining and eventually deciding specifically where you will go (the WHAT). Once this is decided, you’ll need to plan HOW to make this happen…what are the specific steps that must happen for your family to end up in this place on a certain date? From saving money to booking travel arrangements to packing, this plan becomes your “roadmap” to reach your destination. Finally and most importantly, you must consistently take ACTION on these steps even in the midst of life’s demands and influences, or your perfect family vacation will remain just a dream. THE SAME IS TRUE FOR YOUR HEALTH GOALS! If any one of these elements is not considered, your health “destination” will remain just a dream, no matter how motivated you are to get there! The MORE APPROACH is the solution to transform your health “dream” into reality. Perhaps most importantly, in just 8 short weeks, the confidence, competence, and capability to create change! Most MORE clients include ‘weight loss’ as part of their overall health objectives. Traditional weight loss programs demand prescribed behavior…eat this, don’t drink that, exercise like this, etc. But being told what to do doesn’t always result in obedience! In fact, this approach often backfires…creating feelings of restriction and confinement leading to drop-out (sound familiar?). As you’ve read above, the MORE APPROACH is very different. The MORE APPROACH is NOT a diet, an exercise program, or “cookie-cutter” plan focused on quick weight loss. We pursue and celebrate healthy behavior over weight loss. That said, many MORE APPROACH graduates do report weight loss after successfully implementing the program components as a positive result of new consistent health habits. “With Lisa’s valuable knowledge and coaching skills, we were able to develop a health program specifically tailored for where I am in life. I began to see results in only 2 weeks and by 8 weeks, I was confident that we had developed a long-term solution to my overall health.” -Linda W.
How is the MORE APPROACH Offered? Premium Private/Pair Online Coaching: Ideal for clients who desire highly personalized health coaching in a private setting. 1 OR 2 participants work with Coach Lisa for 8 consecutive weeks/1 hour session per week. All sessions are conveniently conducted via video conference. Coach Lisa is personally available to support participants between sessions via email/text. Digital Course: Coming 2019. The MORE APPROACH will be available to purchase as a complete digital course. Ideal for clients who want to work through the curriculum on their own time with support from other MORE members and Coach Lisa via private Facebook group. Investment: These program options make the MORE APPROACH accessible for all budgets, starting at less than a cup of “fancy” coffee/day! Let’s Chat for all the details! I’d like some FREE resources to BE MORE on my own for now. I'm ready to create consistent habits and would like to schedule a free consultation. I’d like online motivation. Click on the links below in the gray footer to follow Coach Lisa on social media.